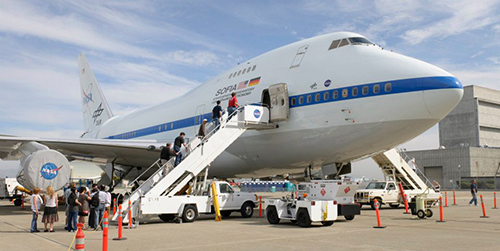 NASA’s Stratospheric Observatory for Infrared Astronomy, SOFIA, will be open for tours during the 233rd Meeting of the American Astronomical Society (AAS) in Seattle, Washington, Jan. 7-9. On Tuesday, Jan. 8, buses will depart the convention center at 8:30 a.m., 10 a.m., 11:15 a.m., 1 p.m., and 2:15 p.m. The last bus will return to the Seattle Convention Center at 5 p.m., for those attending the SOFIA Town Hall meeting, which begins at 6:30 p.m. The schedule repeats on Wednesday, Jan. 9 with buses departing the convention center at 8:30 a.m., 10 a.m., 11:15 a.m., 1 p.m., and 2:15 p.m. The last bus will return to the Seattle Convention Center at 5 p.m.
Cameras are welcome on the tour. Tours are open to registered AAS convention attendees and their guests on a first-come, first-served basis. Each tour guest must obtain a ticket from the SOFIA booth in the Exhibit Hall. To obtain a ticket, you must complete and print this form. All guests must bring this completed form and valid government issued photo ID to obtain a ticket. Each tour guest will provide their full name as it appears on their identification, home address, and driver’s license state, number, and expiration, or, for foreign nationals, passport country, number, and expiration on the form. Please wear your AAS convention badge on the tour. All guests, including minors, must have a ticket to board the bus for the observatory tour and return. Tours are not open to the general public. No guests from Designated Countries – Afghanistan, Bahrain, Belarus, Bhutan, Burma/Myanmar, Central Africa Republic, China, Congo, Cuba, Cyprus, Egypt, Eritrea, Haiti, Iran, Iraq, Israel, Jordan, Kuwait, Lebanon, Libya, Macau (China), North Korea, Oman, Pakistan, Qatar, Saudi Arabia, Somalia, South Sudan, Sudan, Syria, Taiwan, United Arab Emirates, Venezuela, Yemen, Western Sahara, and Zimbabwe. The observatory is not suitable for young children. No guests under 10 years of age. 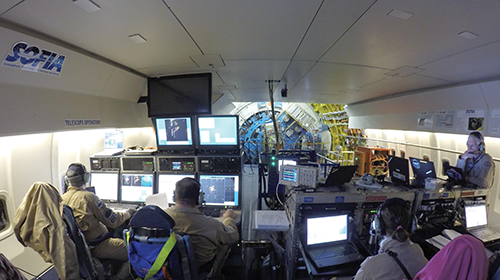 SOFIA is a working science laboratory and is not handicapped accessible. All guests must be ambulatory, able to walk one-quarter mile, and ascend and descent 25 stairs unaided. Guests will be escorted across an active aircraft ramp and must stay together, walking as a group. Please dress for the weather. NASA and/or its representatives reserve the right to refuse admittance to the observatory. No bags, no backpacks, no large purses, no large camera bags. No open-toed shoes, no high heels. Pockets as empty as possible. If anything is dropped it must be picked up. No smoking of any kind. No electronic cigarettes allowed. This is a working observatory and guests are asked not to touch keyboards, monitors, or other mission equipment.